Today, I’m proud to share with you an interview with award-winning author Joyce Magnin as the start of a new blog feature, Words with Friends. God has allowed me to build some great relationships with other authors, and I don’t want to hide those when I feature their books. In Words with Friends, I’ll share an interview and a bit of personal information, too. Joyce and I first met a few years ago when we both served on faculty at the Greater Philadelphia Christian Writers Conference. At our first in-person encounter, I bowed at her feet to show my extreme appreciation for her talents. We share an off-center sense of humor, a love for great literature, and a deep appreciation for Lemon Squares. Elsewhere on this blog, you can read my earlier interview with Joyce and my review of her most recent work, CAKE. 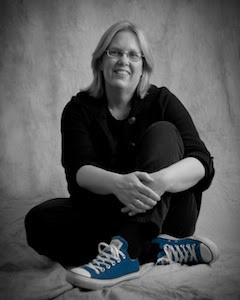 Joyce, a frequent conference speaker and writing instructor, is the author of the popular and quirky Bright’s Pond series along with two recent middle grade novels, Carrying Mason and Cake. When she’s not writing or reading, Joyce enjoys baseball, needle arts, video games, and cream soda, but not elevators—especially glass ones. She listens to many kinds of music, shamelessly confesses to enjoying American Idol, and has never eaten a scallop or sky dived. Joyce has three children, Rebekah, Emily, and Adam; three grandsons, Lemuel, Cedar, and Soren; and one son-in-law, Joshua. Joyce, her son Adam, and their crazy cat Mango live in Havertown, Pennsylvania where Joyce cares for an eighty-year-old onion plant. Welcome, Joyce. Let’s jump right into our discussion. What were some of your favorite books as a child? Mrs. Piggle Wiggle books. Loved them all. Still do. Emily of New Moon, she was one of the lesser-known heroines of Lucy Maud Montgomery, although Anne of Green Gables was a favorite also. The poems of Emily Dickinson even though I didn’t understand most of what I was reading, I just loved to read the words. Pippi Longstocking made me want to have big feet and strap sponges on them to scrub the kitchen floor. Oh, and to have a monkey. Mom wouldn’t allow it, which was kind of disappointing considering our mother let us keep every animal we brought home, including dogs, cats, a flying squirrel, snakes, birds, guinea pigs, mice, and a pig for a short while, but my favorite was the dogs. But, believe it or not I became enamored with Sherlock Holmes when I was around eleven years old. When and why did you decide to start writing for young readers? I was nine. No, really. Middle Grade literature has always been my first love. I love this age group. Everything that is difficult, crazy, scary about this time in the kiddoes’ lives is also what is wonderful about it. I think middle grade literature is some of the best writing out there. I love being part of this. 3. Both CAKE and Carrying Mason have a heroine who triumphs over others who in some way have rejected her. Did you make a conscious decision to champion the underdog? Yep. Heroes come in many shapes and sizes. As I have been thinking about and reworking my vision/mission statement for my middle grade books I have come to realize that the main message (as much as I dislike the term) of my books is that all children are eminently worthy of love. To receive love and give love. Sometimes, kids with particular struggles need to be reminded of this. Was the idea for CAKE something you’d carried around for a while? Yes. Oh my gosh, I had been thinking about writing about magical cake for a long time. I love the idea of infusing magical realism into my middle grade stories. Readers of this age are wonderful and although they know magic is not real they are still willing to suspend belief and get carried away. What do you hope your readers gain from reading CAKE? As I said, my hope is that my words will somehow show kiddoes that they are worthy. Worthy of love. And that taking care of chickens is a good thing, and that sometimes giving love away makes it come back even stronger. Is there anything else you’d like to tell us about your writing in general or CAKE in particular? And I can be followed on Facebook and Twitter. Thanks, Marti, as always a pleasure to visit. Love all you do to promote literacy. I love anything Joyce writes … but CAKE is her best yet. Can’t wait to read what’s next! Thanks for a great interivew, Marti! Agree, agree, agree, Pam. I have loved all her books but I believe she’s truly found her voice in this one. And my pleasure, Pammy! P.S. Lemon Squares, GPCWC 2013? Maybe I can figure out a way to bring a cake!